For those whom he foreknew he also predestined to be conformed to the image of his Son. Romans 8:29. It is a lofty goal, no doubt. However, it is the most important thing you can accomplish today. The world doesn’t need to know more about your religion or your church. They don’t need to see you do a few “nice” things or a few “good works”. They don’t just need to hear what you are against. They need to know Jesus Christ and each day we are ambassadors to this end. 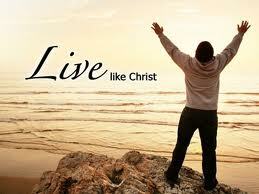 Every believer should live with Christ like intentionality. From the time our feet hit the floor in the morning to the time we lay in bed at night, we ought to be able to sign his name to the day knowing that we sought after his heart and performed his perfect will. Some would say, “That is just impossible, you are setting me up for failure. After all, who can achieve such things?” Too many Christians have set the bar so low in their life. They feel it has been a good spiritual day if they read a few verses, pray over their food and refrain from cussing the other drivers during the morning commute. Jesus desires so much more from your life than you can begin to imagine. 1. Help someone who is hurting. Have you ever noticed that Jesus always intervened in the most disastrous and hopeless situations? In Luke 7 on back to back days he was faced with two alarming situations: The Centurion’s servant and Widow of Nain’s son. One was dying the other already dead. Jesus saw the hurting and hopelessness and healed one and raised the other. The woman at the well in John 4 was seeking the wrong kind of water, Jesus quenched her eternal thirst. The adulterous woman in John 8 was facing a death penalty, Jesus saved her life and gave her a new one. Countless number of examples of someone hurting and Jesus helping. He is calling us to do the same thing. All around us today are people who are hopeless, hurting and wounded. The lady down the street who just lost her husband, the co-worker battling cancer, the friend who lost his job, they are all in need of Jesus today. They need Jesus in you. Be like Jesus and intervene. Give help, hope and a Christ like hand! 2. Forgive someone who has hurt you. It has been said that we are never more like Jesus than when we forgive. On the ugliest day in human history the recipient of the ugliness did something so incredibly beautiful. “Then Jesus said, ‘Father, forgive them, for they do not know what they do.” Luke 23:34. And with that statement from Christ we are left without excuse when we withhold forgiveness from others who have hurt us. Jesus told Peter to forgive 70 times 7. It is impossible for you to live as Christ and have hate in your heart, It is impossible. The ability to forgive is what sets Christians apart from others. With the love of Christ in our hearts, it is impossible to hate someone. We may feel animosity or extreme anger, but his love in us drowns the filthiness of such emotions. “For if you forgive men their trespasses, your heavenly Father will also forgive you. But if you don’t forgive men their trespasses, neither will your Father forgive your trespasses.” Matt. 6:14-15. 3. Pray often! If there was ever one person who could have gotten a pass on prayer, it would have been Jesus. Because he was the “Logos”, the incarnate one, the second member of the Trinity, if we never saw him pray one time in the Gospels no one would ever question it. After all, we would say, he is the Son of God, no need to pray on a regular basis. Yet, Jesus prayed often. So many times in Scripture we find him praying before the sun came up. We see him praying on a mountain, in a garden, at the temple and even on the cross! He prays for hours with such depth. His prayer on the mountain was so powerful that Elijah and Moses come back from heaven just to take part in it. If I want to be like Jesus, I need to pray like him. His prayer life touched his disciples so personally they asked him to teach them how to pray. (Luke 11). Maybe we should do the same thing? Most Christians have such a myopic view of prayer, yet communication with God is the key to unlocking the power of heaven! If Jesus felt the need to pray for hours every day, how much more should we? 4. Memorize Scripture. This is an often overlooked part of the life of Jesus. There are over 80 references in the Gospels of Jesus quoting Scripture. The beginning of his ministry was marked by him quoting Scripture. He defeated the devil by quoting the Scripture and he began his public ministry by citing Isaiah 61 (Luke 4). His teachings were based on Scripture memorization as he quoted passages during the sermon on the mount, taught in the synagogues and confronted the Pharisees. Even on the road to Emmaus after his resurrection he gave a walking bible study to Cleopas and a friend. Jesus’ memorization of OT passages allowed him to overcome the enemies attacks, but for those who don’t know Scripture they have no such ammo. If Jesus needed to memorize Scripture to overcome temptation, don’t we have the same need? Memorize a verse today and you will be on your way to being like Jesus. 5. Surrender to the Father’s will regardless of the personal cost. Several years ago a popular song stated, “When he was on the cross, I was on his mind.” That is a great thought, but we were not prominent on the mind of Christ while on the cross. Consuming his mind that day was doing the Father’s perfect will. This is easily displayed by his 7 statements on the cross. The life of Jesus had but one purpose, fulfill the Father’s will. The focus of Jesus was spectacular. What stunning words we read in Luke 9:51 as he began his journey to Jerusalem, “Now it came to pass when the time had come for Him to be received up, that he steadfastly set His face to go to Jerusalem.” The Greek speaks of resolute focus. The journey to Jerusalem ended on the cross. As Jesus called disciples to follow him he immediately gave them a clear mandate, “If anyone desires to come after me, let him deny himself, and take up his cross daily and follow me.” Luke 9:23. One of the most important things that you can do to be like Jesus today, is to forget about you.